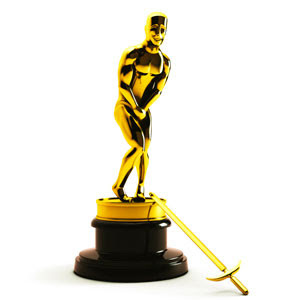 Cam's Cinematic Episodes: Epi-Cast: Episode 22 - "Oscarploitation!" Running on precious little sleep, and over-caffeinated beyond all rational levels, Cam and Tom take to the airwaves after enduring 3.5 hours of Oscar-fuelled excitement. How did they feel about the winners? The losers? That awful interpretive dance/B-boy segment? They'll tell you loudly and politically-incorrectly as possible. Such is their gift to you. P.S. We are also available on iTunes! We kid you not! Simply do a store search for "Epi-Cast" and, ZIMMER-GIACCHINO!, you can subscribe to our feed and receive insta-dl's (Net speak for downloads). Oh, and we are the "Epi-Cast", not the "Epicast". Avoid those pretentious fools like a pack of flesh-consuming carpet monkeys.